We will continue to preserve, enhance and promote the Dark Hedges for future generations. Already well past maturity it is important to maintain the trees for future generations to marvel and enjoy this naturally and culturally important heritage landscape. The Dark Hedges Preservation Trust will endeavour to maintain safe access to the site for visitors and locals. This will be demonstrated by regular tree surveys by a qualified consultant and followed by the recommended works. All works will be carried out by qualified arboriculturalists. The Stranocum and Armoy wards are listed in the DENI 30% most deprived Wards and Super Output Areas under Education, Skills and Training Domain. 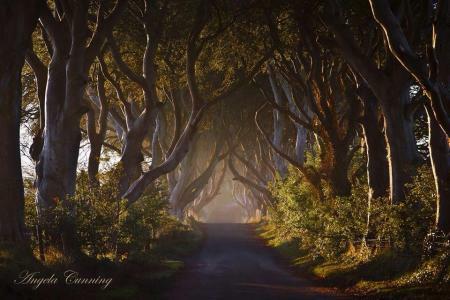 The Dark Hedges Preservation Trust will conserve an area of economic and cultural value to this region. Voted in an internet poll as one of the top five most beautiful tree tunnels in the world this phenomenal asset brings thousands of annual visitors from all corners of the world. The Dark Hedges Preservation Trust will utilise the hedges as a learning tool by improving and developing interpretation around the hedges. The Trust will do this by providing interpretation at the site on panels that complement the landscape, in leaflet format and on digital media. The Trust will also engage local schools, historical and community groups in replanting schemes and local coach/tour companies to circulate educational information.